These raw, unprocessed images were taken during Cassini's close flyby of Tethys on June 27, 2007. These raw, unprocessed images were taken during Cassini's very close flyby of the icy moon Tethys on September 24, 2005.
at first glance, i do see distance between Saturn and Tethys. 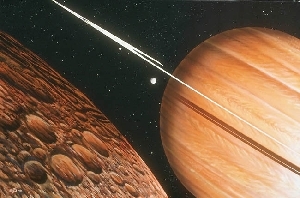 i have to concentrate a little to see all the distance the perspective of the rings indicate is there, but i can see it. a little concentration in the other direction and i can see Tethys at the same distance as Saturn, hovering over the pole. fun to play with. Fascinating again and showing details on Tethys, too. This is a rare and stunning image of Thethys because we don't usually see so many of the large craters althogether in such luminous relief. The top one must be Odysseus. The bottom one might be Melanthius but that crater seems too far North. And the fainter big crater in the middle looks like Penelope. Please correct me if I'm wrong about these craters. I've checked the maps and can't figure out any other interpretation. But then this could be because of the Sun-Tethys angle and similar to our own Moon this Cassini image could be a unique angle that throws shallower craters into greater relief. But still, this is a most interesting image of Tethys. It says something to me that seeing even a familiar moon from just a few illumination angles is not enough for me to know it. Heck, Tethys is dwarfed by one circular cloud formation in the southern hemisphere. i can just imagine if we had a storm with a larger diameter than our moon. 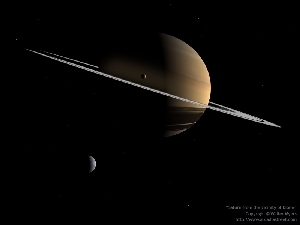 on Saturn, a storm with a diameter larger than Titan might be just medium sized. what a system! R164 raw 2 shows mostly crater-saturated terrain, but in the upper left quadrant a couple of features are noteworthy. The first is that Fault scarp from the large, irregular crater to the double crater (likely due to a simultaneous impact of two bodies). The scarp casts shadows along 2/3 of its length, then suddenly changes to a bright cliff; this suggests a rotation has occurred on an axis normal to the fault. Second is a lobate flow, off the rim of �North Dike� crater, whose sharpness of form makes it seem to float above the underlying landscape. It appears to be a viscous flow, rather like Pahoehoe lava, in contrast to the loose-matter flows in �South Dike� crater. Crater chains abound in this scene, too. Tethys is definitely interesting, and probably has more surprises for us. At the middle of this image there's an impact basin, I suppose. It's looking rather degraded. It has got 2 rings and a central peak, I suppose. It's looking similar to the Odysseus Basin on Tethys and less similar to the Herschel Crater on Mimas, I suppose. At my first glance I didn't notice it and this image looked more boring. Hi NeKto I have not been here for a while. That is true, perhaps the flow lines could also indicate mass concentrations within Helene. I also understood that the flow lines could also be from ice swept up from the geysers on Enceladus. 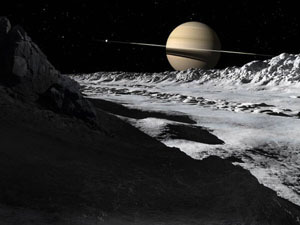 The Tethys tojan moons Telesto & Calypso are also largely covered in fine ice & Calypso too shows hints of flowlines. 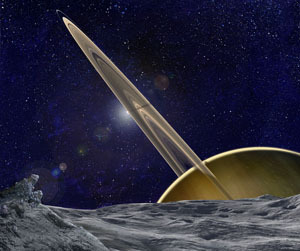 Would be interesting to get a close up of Polydeuces if possible too, the other Dione trojan moon, the one that trails Dione. Polydeuces is only about 3.5 KM wide at most, so Helene is very much larger. Andrew Brown.